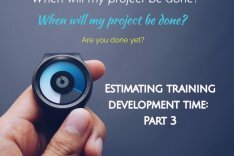 This is the second in a series of posts on how to estimate the time needed to complete training projects. In my last post, I talked about how to use past development projects to create future estimates. But what if you don’t have any data from your past projects, or conditions are different, or you want to know if your team is performing well? In these cases, you can refer to industry standards. There are two often cited research studies that looked into how long it takes to develop one hour of training. Both studies used the full development life cycle, from design through deployment, in their estimates. They also both breakout eLearning into different levels based on its complexity and amount of interactivity. I was curious to see how the results of these studies compared. Kapp and Defelice provide a high and low estimate for each output format. Chapman provides three estimates corresponding to simple, average, and complex projects. So, in the chart below, I’ve included an average value for the Kapp & Defelice estimates that corresponds with Chapman’s “average” estimate. I refer to the eLearning levels as 1 for low interactivity, 2 for moderate interactivity, and 3 for high interactivity, like it is done in the Chapman report. The only distinction I make in the eLearnings levels is amount of interactivity, I combined the estimates of template vs. non-template development from the Kapp and Defelice report into each level. I did not include the Kapp and Defelice estimates for equipment and hardware simulations because the development time for those cases are well out range of other types of projects. I treat all three ILT formats (stand-up, print and web) identified by Kapp and Defelice as one “ILT” category and take the high and low values from that data set. The findings show a fair amount of overlap, except for eLearning Level 2. I imagine this might be due to improvements in authoring software and the increasing skills of eLearning developers. Before using the data from these studies to form our own estimates, it’s good to understand what makes up an hour of training. 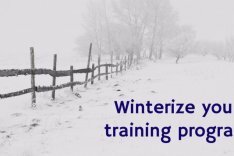 In my experience, an hour of ILT training material consists of about 20-40 slides depending on the amount of presentation, discussion, and activities. 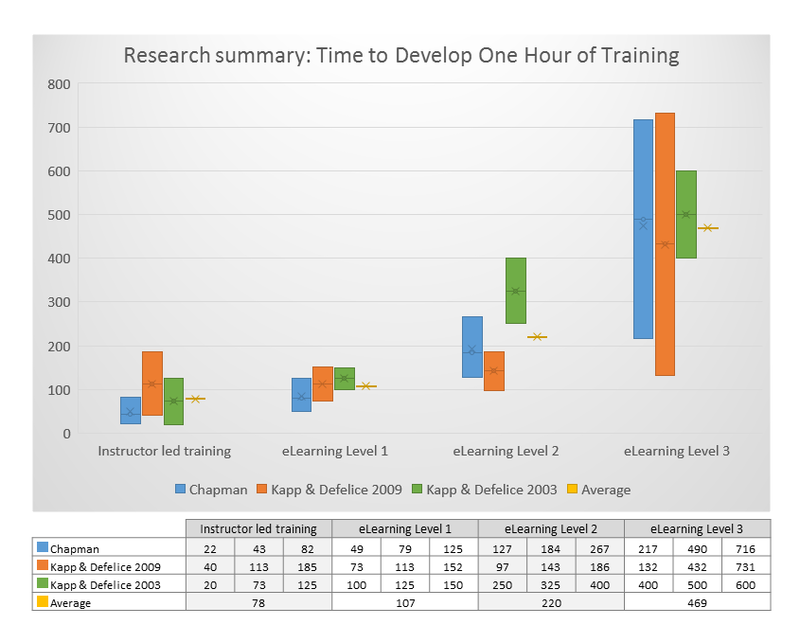 Another way to think about what goes into an hour of training is by scope. Scope gets us thinking about good instructional design. As a rule of thumb, in an hour of training, I aim to cover 2-3 “big” topics including presentation, reflection (discussion or interaction), and application. The advantage of thinking about scope is that you can take a training request that comes in as a list of topics and put together a rough estimate of how many hours the total project will take. Start by choosing the output category that best matches your project. I use the average value as my initial estimate. For example, my initial estimate for a Level 2 eLearning project is 220 hours. How much does my team know about the topic? Is the course for novices or people with prior knowledge and experience? Are good reference materials available? What sorts of activities need to be created and what environment will they require? What is the priority for this project? Is there anything else that is preventing my team from beginning to make progress right now? The two studies include SME time in their estimates. In the Chapman report, it accounts for 6-8% of the total time. Kapp and Defelice cite SME time as a major reason for the increase in estimates from 2003 to 2009. I find SME time highly variable, so I don’t count it in my estimates. I work it in once I build my schedule, know who my SMEs are, and know more about their availability, experience, and enthusiasm for the project. Your team will create better content and create it more quickly if they understand the topic. If they are writing about a software product, have them use it, test it, and learn about customer problems. It’s best to do this as part of an ongoing professional development plan, but if that’s not possible, build some skill building time into the project estimate. If your team is going to largely need to teach themselves without the aid of a SME or existing resources, add another 20% to your estimate. I once managed a team of novice instructional designers whose first major project was to create eLearning. That was an “add 50%” situation! More often, you will be able to pair an inexperienced ID with a more senior member of your team. You will want to add in time for reviews and revisions as the new member of your team gets up to speed. I typically assign a high and low project simultaneously. The low priority project is something that can be picked up when the high priority progress is halted, for example when you’re waiting for SME feedback. While some people handle multi-tasking really well, for others it’s a source of stress and a cause of errors. Add in a buffer if your team is working on more than two projects or if the two projects they are working on are both time sensitive. This is simply added time for vacations, illness, or emergencies. I recommend reading through the Chapman and Kapp and Defelice reports to understand how their estimates were formed. Then, make your own adjustment checklist. Connie Malamed at The eLearning Coach lists additional factors to consider when forming your estimates. 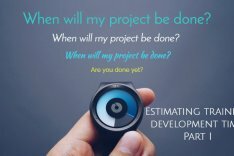 And Christy Tucker over at Experience eLearning has an excellent post that describes her estimation process. The studies discussed in this post are a few years old, but the data is still good for rough estimates. I’ve read that Kapp and Defelice are continuing to collect data. The article that mentioned the continuing study is from 2009, but the survey is still up and running. One word of caution about using industry standards. Every team is unique. Having a benchmark to reach can be motivating for some and threatening to others. Keep in mind that a team’s velocity is made up of how fast individuals work alone and together. If your team isn’t performing as well as you would like, develop individual skills but also look at how the work is distributed and how tasks are handed off between team members. Ultimately, you may want to measure performance of your team members and their performance as a whole. In my final post in this series, I’ll talk about how to do that and one tool I’ve found particularly helpful. Very helpful….this data helps rationalize my “gut” estimates. I was off…unfortunately, to my own detriment! Hi, Annette. I’m glad you found this information helpful! I’ve definitely been there with off estimates and all the stress that comes with it. My “gut” is too ambitious, as if high pressure scheduling is some form of customer service. The general buffer is the best defense I have against this tendency. I used to feel guilty using it, but now I just see it as part of quality control. None of my clients has ever been disappointed to get a project earlier than predicted or too shy to push back when they needed a tighter timeline. Let me know how your future estimates go! Hi! I cannot see the chart in the article. Is it available somewhere…? Thank you! Hello, Klara. Thank you for bringing this to my attention!